He’s most often seen dealing with perps in the streets of Mega-City One, but Judge Dredd’s world stretches much further – other stories have taken 2000AD’s leading lawkeeper to the Big Meg’s Soviet counterpart, into outer space, and, perhaps most notably, to the post-apocalyptic wasteland that most of America has become – the Cursed Earth. 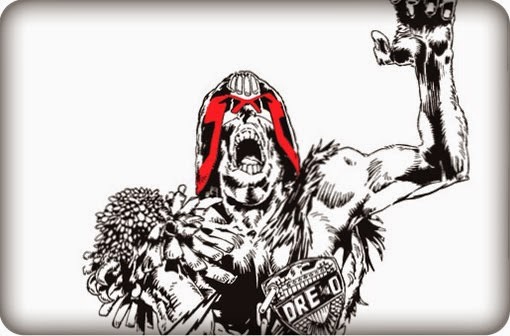 The Cursed Earth was explored in this early adventure, which lasted for twenty-five instalments in 1978 and became known as the first Dredd ‘epic’. The west coast’s Mega-City Two has become plagued by a virus that turns its inhabitants into ravenous cannibals. With MC-2’s airports shut down, it’s up to Dredd to take the long journey across the wastes with the vaccine. This story is essentially a backdrop to Dredd’s adventures along the way, a series of encounters with the brutality of Mad Max and the daft satire of the Fallout games. There is indeed a dinosaur, in fact several – escapees from a dinosaur theme park. And yes, this came before Michael Crichton penned Jurassic Park. Dredd also encounters flying rats, a futuristic death race, and Mount Rushmore with a couple of new additions. It’s very silly compared to grittier modern Dredd and feels aimed at younger readers, but don’t let this fool you into thinking The Cursed Earth is shallow fare – 2000AD’s sharp satirical edge is present in radioactive bucket-loads, while the way this story depicts Dredd himself is very interesting – the usually stern Judge is the only guy standing up for the oppressed aliens, and, though he heads out into the Cursed Earth with a distrust of ‘muties’, the Dredd who arrives at Mega-City Two is one step closer to the Dredd who’d later stand up for ‘mutie rights’ in some of 2000AD’s most political stories. Everything great about 2000AD is present in this astounding variety of weird and wonderful adventures, particularly its firmly British satire. The Cursed Earth is classic Dredd ramped up to 11, and it really is a joy.